Urban sanitation interventions have historically focused on sewers or onsite sanitation options, such as pit latrines and septic tanks, but as cities are expanding at staggering rates, it’s increasingly clear that these traditional technologies are infeasible and unsafe in most urban environments. What’s also clear is that sustainability in our rapidly urbanizing world will require no less than a complete reconstruction of our cities. Instead of relying on systems that cause planetary harm, we’ll need to create ecologically regenerative infrastructure that provides needed services to urban residents while restoring a city’s ecological integrity. SOIL’s container-based sanitation (CBS) solution has been gaining global traction as an effective, affordable, and regenerative alternative. In order to support global replication of this innovative solution to both the ecological and urban sanitation crisis, SOIL is working to make our service the best it can possibly be and make it as cost-effective as possible. So, that’s just what SOIL did, alongside Claire Remington of the University of Victoria (who also happens to be our dear friend and SOIL’s former EkoLakay Advisor!). Our goal? To develop a baseline estimate of the monthly direct operating costs of SOIL’s sanitation service per household, identify opportunities to optimize operations, and improve our operational team’s management of the service. What’s Involved in Operating a Safe Sanitation Service? What are the costs involved in operating SOIL’s sanitation and waste treatment services? First, it’s the containment and collection of waste itself, but it’s also the transportation of that waste to SOIL’s composting sites and then the treatment and transformation of waste into agricultural grade compost. In order to get a complete and accurate look at our expenses from the bottom up, we got into the nitty gritty throughout the research. How long does it take to empty each container? How many miles does the SOIL Poopmobile need to travel to bring waste containers from the communities served to the waste treatment site? SOIL crunched the numbers for each of these steps and broke down what it then costs for every household to have an EkoLakay toilet in their home. SOIL’s final process cost analysis gave an estimate of $14.92 per household per month for providing full cycle sanitation service from the toilet through to waste treatment and reuse. The results also showed that around 30% of these operational costs are covered with operating revenue, which comes in the form of EkoLakay’s monthly service fee and compost sales. At the moment, the remaining cost of the service not covered by earned revenue is being covered by foundations and individual donors. In the figure above, the green box of $8.00 per household per month labelled Contributions is how much our monthly recurring donors, the SOIL Cultivators, are currently covering to make sure we keep the service operating. To fully offset losses, at our current scale, we need to raise an additional $2.46 in monthly donations per household for each of the 1,000 households on the service. You can learn more about the impact of monthly giving and sign up for a monthly donation to support SOIL’s service at www.oursoil.org/Cultivators. We’re aiming to create a climate-smart, ecological sanitation system that’s more cost-effective than alternative approaches and sets a standard for how to provide dignified, affordable sanitation services to the 700 million urban residents globally who currently lack access to sanitation. 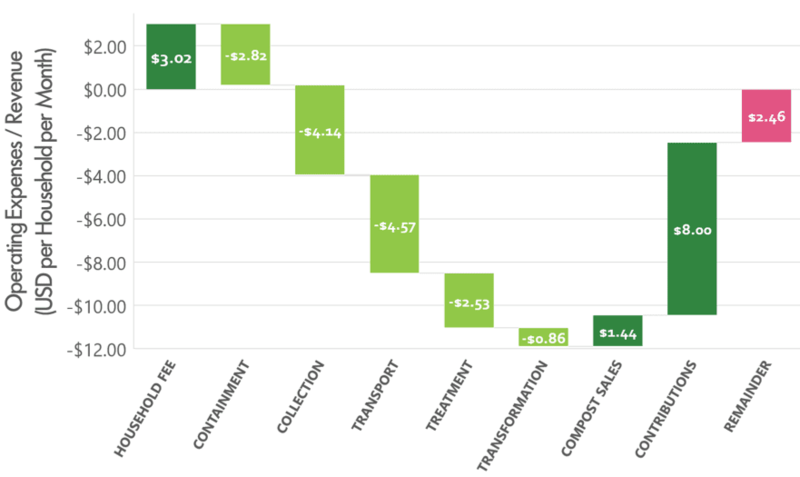 While SOIL is starting to use findings from the process cost analysis to identify productive areas for further cost reduction, we’re already pretty pleased that the direct operating costs of our service are so low and that we’re recovering 30% of our costs through earned income. Not enough research has been done yet on the cost effectiveness of alternative approaches such as sewers or septic systems but preliminary research shows that traditional sanitation technologies are much more expensive. An often-cited paper from Senegal found that the annual capital and operating cost of sewers was approximately $25 per household per month*, with only 4% cost recovery. While sewers don’t even exist as an option in Haiti yet, we already know they’d be extremely expensive to install, operate, and maintain, as they depend on the availability of steady water and energy supplies, they are politically untenable to install in informal settlements with questioned land tenure, and they present few opportunities for resource recovery. Where full cycle municipal-level sanitation services do exist around the world, the services are heavily subsidized by public funds. In recent decades, there’s been a strong emphasis on increasing cost recovery rates for water and sanitation services through user fees, but SOIL believes that it’s unrealistic and unethical to expect families living in extreme poverty to bear the full cost of these services, while those living in higher income countries have services that are invariably supported by public funding. This pressure to develop sanitation solutions based on user fees for the world’s most vulnerable populations can put an undue burden on providers to raise fees to the point where the poorest households are priced out, or to cut costs through reduced service quality. So, while we know this research is critical for SOIL as we work to identify ways to increase EkoLakay’s efficiency, we know that user fees alone will not be able to cover the full expense of the service if we remain dedicated to ensuring that our services are accessible to all in Haiti. We’re therefore incredibly grateful to our donors and supporters for helping finance our service and R&D like this study as we work to scale our solution, further reduce costs, and put in place blended-revenue financing in partnership with the Haitian government and multi-lateral financial institutions. Beyond supporting the development of EkoLakay’s business model, the baseline cost estimate that we produced through this research provides a point of comparison with other sanitation models across the globe. From this research, other groups have already begun to use the methodology SOIL developed to analyze the costs of providing sanitation services and to productively share and evaluate innovations across implementers. Though this paper is just getting published now, SOIL actually wrapped up this research at the end of last year, which means that we’ve already been operationalizing many of the lessons learned. SOIL has used the cost estimates to to identify productive areas for cost reduction and further innovation, like finding cheaper sources for gloves, which we learned are a big driver of costs! We’re also now working with DataKind, in a partnership facilitated by the 11th Hour Project, to improve our logistics, another expense that SOIL is confident we can reduce over time. 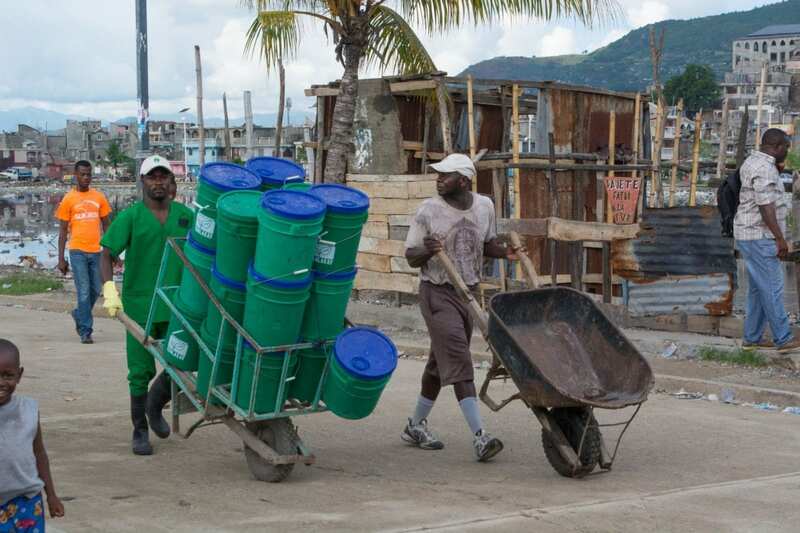 Stay tuned to learn more about the work SOIL is doing to support the global effort to research the cost-effectiveness of sanitation option and to improve our own direct service provision in Haiti. And if you’d like to learn more: read the full report here. 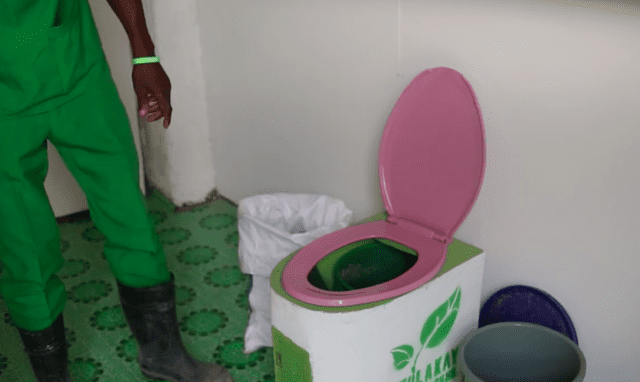 SOIL is a non-profit research and development organization pioneering affordable and sustainable environmental solutions to the global sanitation crisis in Haiti. To read more of our research, visit this page and join us in this critical work by making a sustaining donation today. *$54.64 per user per year, assuming an average household size of 5.5. We revamped SOIL’s email list to ensure we’re compliant with new data laws and that everybody on SOIL’s mailing list wants to receive our monthly updates. If you had been receiving them before but haven’t re-joined or you are interested in signing up, do so today! 1 Reply to "New Paper Digs into Process Costs of SOIL’s Regenerative Sanitation Service"
#WEDC41 Part 1: The challenges of the world’s number 2 business — Water.Women.World.